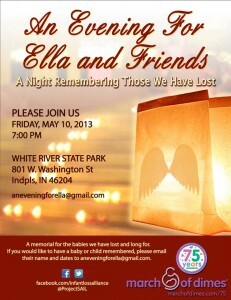 If you are in the Indianapolis area, please join us for An Evening for Ella and Friends. The event will take place on Friday, May 11th at 7pm, White River State Park in downtown Indy. This event is held in remembrance of Ella Therese McMahon and all babies we’ve lost and long for. If you have a baby or child you would like to be remembered during the event, please send their name and date(s) to aneveningforella_at_gmail_dot_com.